12DailyCoins have come up with a straight forwards investment offer – 12% daily for 12 calendar days, initial deposit included in the payments. The minimum investment is $ 10, maximum $100 000, in turn, minimum withdrawal is $1 and the maximum is not set. 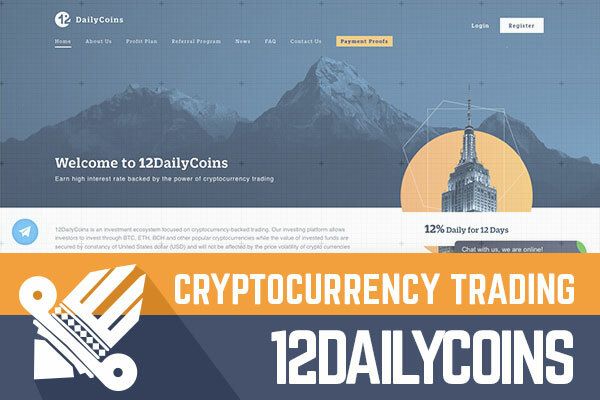 12DailyCoins accepts the most popular cryptocurrencies - Bitcoin, Ethereum, Bitcoin Cash, LiteCoin, Dash and DogeCoin as well as investments in USD via Perfect Money and Payeer. BTC, LTC, Dogecoin, PerfectMoney and Payeer withdrawals are processed instantly, however, withdrawal requests for Ethereum, Bitcoin Cash and Dash are paid within 24 business hours. If you are someone who prefers such sort term offers over more cautious ones, keep reading this review to find out more! In one of my latest reviews of 2018, I stated that I enjoy reviewing HYIP programs that keep up with time in terms of technical solutions provided to the investors. However, in terms of potential investments, I would say that contemporary or innovative investment/withdrawal solutions can’t really compete with the good old combination of a good investment offer. In the case of 12DailyCoins, the first aspect is a matter of personal preferences. For some, the offer is just right up to their street, for some – a short term offers to keep away from. Yet the second – the job with the program is well done. Simple, easy to browse the website, that provides everything potential investors need – an investment calculator, information about referral program, FAQ etc. without the feeling of a fast job. But does it make 12DailyCoins to stand out among other similar programs? Maybe not. But the point I’m trying to make here is, that the job that admins have done doesn’t scare you away. And often it’s a part of success. The comparatively high daily interest rate could make this program stand out among others that have joined the industry lately. However, another aspect that could make it more attractive among other so-called cryptocurrency inspired HYIP programs, is the variety of payment methods both for cryptocurrencies and USD that gives everyone the opportunity to choose. What else potential investors can find on 12DailyCoins.com to make any judgements about this program? Besides the legend that’s pretty standard for so-called cryptocurrency inspired program, including marketing slogans of breaking down the barrier of cryptocurrency for people, there are a few other things that might be interesting to take a look at. The first one I noticed, is the certificate of incorporation available on the website. Admins have done the homework adding it on the website, however, I have noticed a little mismatch. 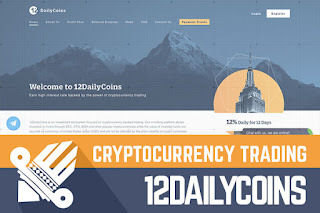 On the website, they call themselves 12DailyCoins Ltd. But in the certificate incorporation 12CD Limited. Of course, it doesn’t affect the performance of the program in any way. The second is the approach that the admins are promoting. Of course, 12DailyCoins offers short term investments. However, 12DailyCoins describes themselves a lifetime investment program with a long-term business strategy. When you take a closer look at the FAQ page you can even find an answer to a pretty unusual question for a HYIP program – How long do you plan to offer online investment services? Head to the website of 12DailyCoin to take a look at the answer! What does the internet say about this 6-day old program? According to Alexa rank, currently, the main 12DailyCoins audience comes from Iran, Switzerland, India and Canada and Nigeria. Of course, Alexa rank must be perceived only as a hint. The program has both Twitter and Facebook accounts, however, both of them are without any content for now. When it comes to forums people are discussing both the investment offer – the opportunity to earn and the opportunity to lose and the job of the admins - the successful design, for example. However, some recall a project in the past with a similar name. If anyone remembers a similar project, leave a comment below! So, let's take a look at the investment offer – 12% for 12 calendar days. For this program the math simple. An investment of $200 would generate a daily return of $24. With 12% daily, the break-even point is reached after 9 days. And at the end of the investment term - 12 days, the investment would have made a net profit of $88 and in total $288. As by judging the investment offer, 12DailyCoins is a program that will definitely attract or scare away the potential investors. However, if you are the one who decides to take a chance, remember – don’t invest more than you can afford to lose! Have you already made an investment in 12DailyCoins and have any useful information to share with us? Please drop a message in the chat box to share your experience! Investment plans: 12% daily for 12 calendar days. Initial deposit included in the payments.